Help boost skin’s natural radiance with our 3-in-1 multi-tasking body oil. It glides on and absorbs instantly to soften skin and lock in moisture. Helps to enhance skin tone and reduce the appearance of stretch marks and scars, leaving skin feeling pampered, smooth and with a subtle sheen. A definite after-shower must have. 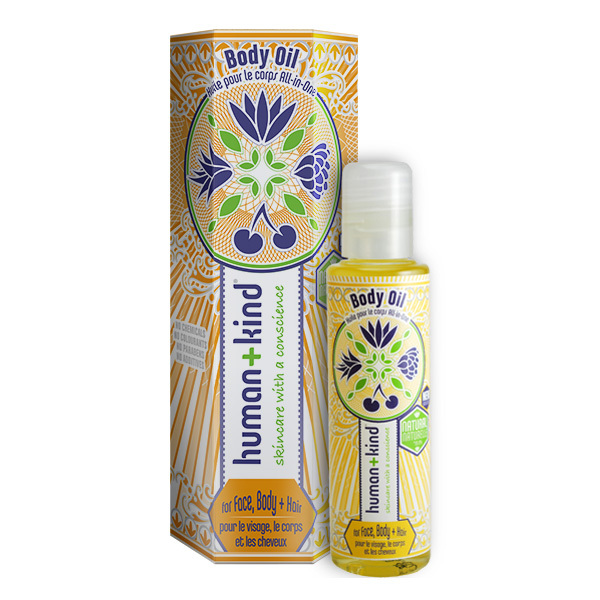 Body Oil can be used on the face, body and hair. Instructions for use: Face: Apply a small drop of the body oil to the face for deep moisturisation before bedtime. Body: Apply to damp skin after showering. Apply to stretch marks and scars as required. Hair: use a small drop to run through the hair for dry scalp or dry ends or use as a serum to tame frizzy hair. Avoid contact with the eyes. Human+Kind is a new ethos in skincare for today’s time-pressed women- simple, natural and dependable beauty products that multi-task as much as you do. Glycine Soja Oil (Soya Oil): Soya bean oil contains many natural antioxidants. It helps to stimulate collagen production in skin which helps in the treatment of scarring and stretch marks. It also helps to reduce inflammation and increase elasticity. Its revitalizing and emollient properties make Soy Bean Oil particularly effective for skin that is undergoing change for example during pregnancy as the skin stretches. Helianthus Annuus Hybrid Oil (Sunflower Oil): Very high in the antioxidant vitamins A, C and E which help prevent oxidative damage to your skin caused by free radicals. Vitamins C and E are also useful in the treatment of inflammation and skin conditions by speeding up the natural healing process. Sunflower oil also provides your skin with natural protection against bacterial infections. Simmondsia Chinensis (Jojoba) Oil: Simmindsia Chinessis (Jojoba) Oil is suitable for all skin types and is easily absorbed into the skin.’ It has exceptional skin softening properties as well as the ability to minimize fine lines and wrinkles, while assisting with the rejuvenation of the skin. Jojoba oil is well tolerated by people with skin problems and doesn’t aggravate acne. Triticum Vulgare Germ (Wheat germ) Oil: Wheat Germ Oil is rich in essential fatty acids that promote cell generation and growth. It is a naturally rich source of Vitamin E. It is particularly good at reducing and treating the appearance of scars and stretch marks.